I am thrilled to announce that I have been awarded a new Great Outdoors Colorado - GOCO planning grant, which will support NOCO PLACES 2050 (Northern Colorado People, Land, Access, Conservation, Ecosystems, Sustainability) and Clear Creek County. This grant will go to supporting MENV students and will support leadership and strategy in addressing the increasing pressure on Colorado's public lands. More information here. 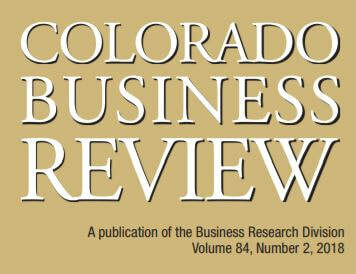 In the May issue of Colorado Business Review, I discuss how the Masters of the Environment Graduate Program is helping to shape the conversation on recreation economies and public lands use. By providing project-based and experiential learning opportunities, our faculty are working with students to develop new knowledge and to equip them with skills and critical thinking to make an impact. Former graduate student current PECAR team member Nick Dowhaniuk featured in the College of Liberal Arts and Sciences Winter Newsletter. 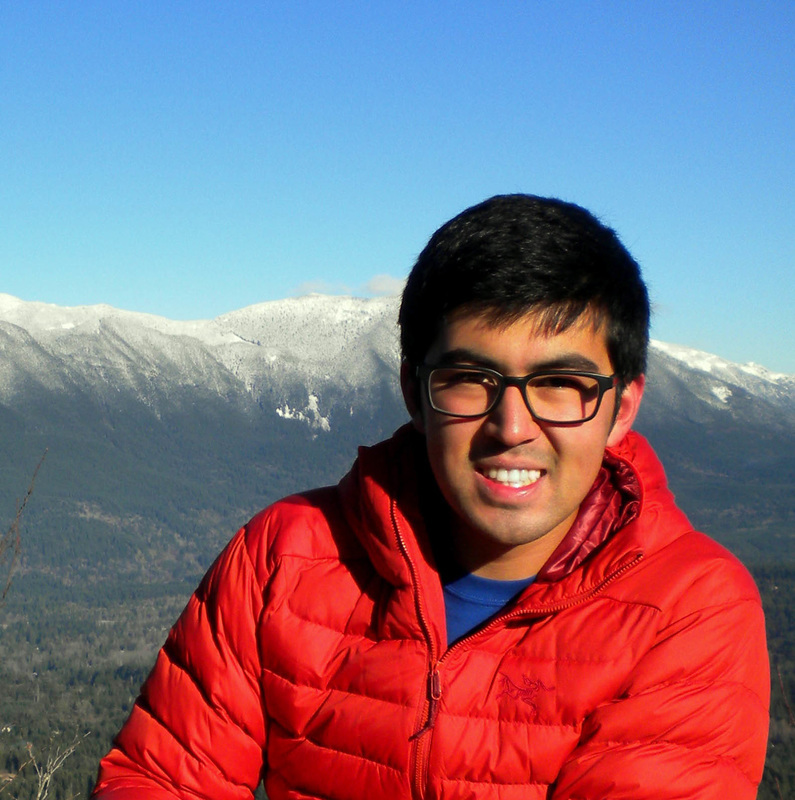 Nick is pursuing his PhD in geography and will be conducting fieldwork in northern Uganda. His goal is to improve healthcare access and delivery in East Africa well into his professional Career. Keep up with the adventures and great work Nick! ​In the January 2018 issue of American Scientist, Jonathan Salerno and KAZAVA Team members discuss elephant conservtaion. Elephant numbers across Africa have dropped by as much as 60 percent since 2007. Increasing global demand for ivory, especially in China and elsewhere in Asia, has exacerbated elephant poaching in Africa and induced international outcry. This situation has prompted changes in wildlife conservation policy, often without locals’ knowledge or input. Botswana has remained a stronghold against the rise in ivory poaching. Although numbers of elephants are decreasing overall, in Botswana they are increasing or stable. The livelihoods of the people in the paths of growing numbers of elephants in Botswana are shaped by the animals’ presence. In “Living in an Elephant Landscape,” Jonathan Salerno, Lin Cassidy, Michael Drake, and Joel Hartter—a group of ecologists and geographers—talk about how wildlife conservation policy in the region currently affects locals, and how their voices could be better included in the policy-making process. See the article here. Graduate students in my classes work with Craig and Breckenridge on managing recreation economies. The project in Craig focused on developing new recreation proposals for the community. More here. 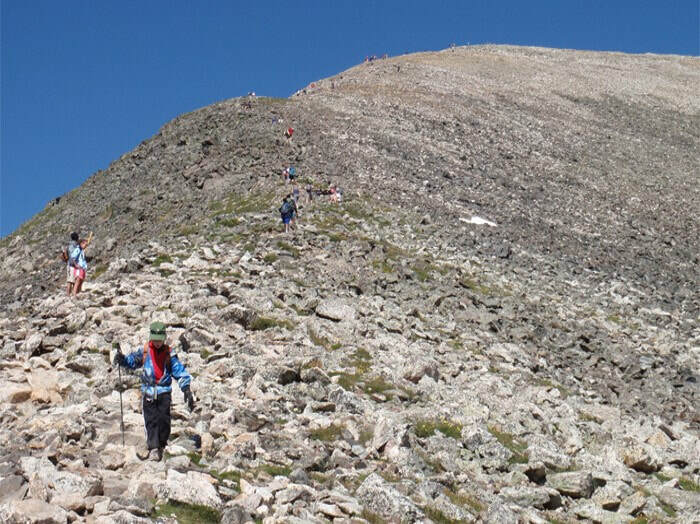 The project on White River National Forest focused on management of high use on Quandary Peak. More here. 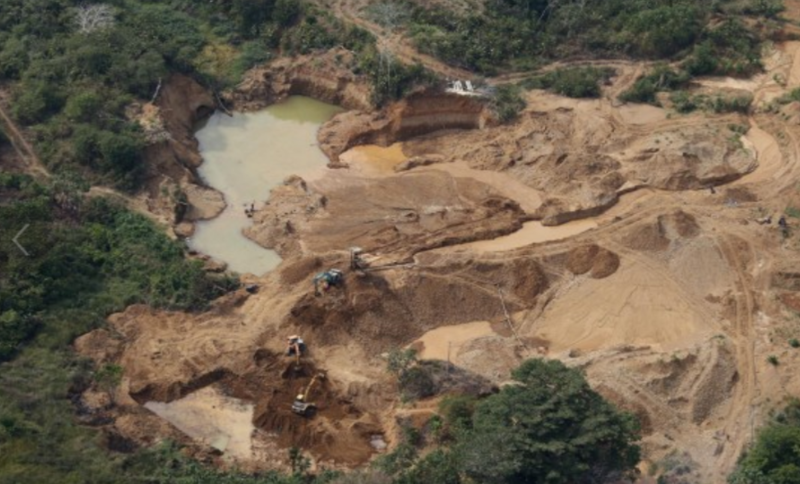 A five-year, $4M National Science Foundation grant will fund an integrated effort to tackle public health and environmental challenges posed by artisinal and small-scale gold mining in Colombia and Peru. 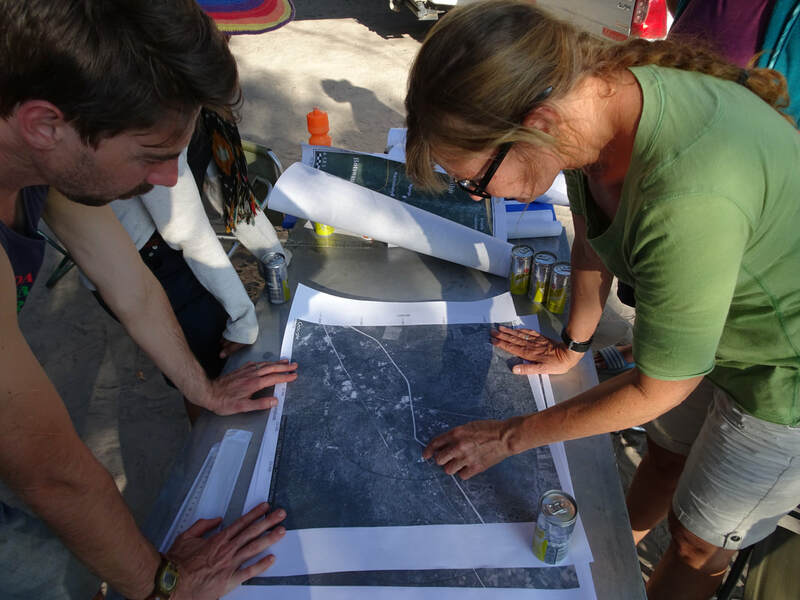 This project is led by Colorado School of Mines and partners with Joel Hartter in Environmental Studies at CU and Colleen Scanlon Lyons, a project director for the Governors Climate and Forest Task Force. More on the grant here. ​Graduate students from the University of Colorado's Masters of the Environment program visit Yampa River Diversion Park project in Craig, Colorado. New grant awarded to fund ongoing Population, Environment, and Climate in the Albertine Rift (PECAR) project research. Understanding the Role of Moisture Transport in Rainfall Variability and Agricultural Decision Making. This project will examine the link between atmospheric processes and decisions made by farming households that depend on rainfall for food security. Food insecurity, which can result from variability and long-term changes in rainfall, is considered a “threat multiplier” by the U.S. Department of Defense and poses a risk to U.S. national security. The project will advance the integration of geography and spatial science through interdisciplinary research in rainfall variability and climate-related decision making. This integrated approach is necessary to advance understanding of how rainfall variability influences local knowledge systems – and, conversely, how those local knowledge systems can better aid understanding of rainfall variability. This research will identify the atmospheric conditions responsible for relatively wet and dry seasons on a spatial scale that is fine enough to be relevant to individual communities. Stable isotopic analyses of rainfall and high-resolution satellite products will provide information on the source and transport history of moisture that ultimately falls as rain. This information can be used to sharpen the skill of weather forecasts and help guide farmer decision-making. Scholars, with CHANS-Net members’ help, identify sustainability’s 40 biggest questions.Top 40 Questions in Coupled Human and Natural Systems (CHANS) Research highlights the current view of researchers active in the field on research questions to pursue in order to maximize impact on understanding and managing coupled human and natural systems for achieving sustainable development goals and addressing emerging global challenges. 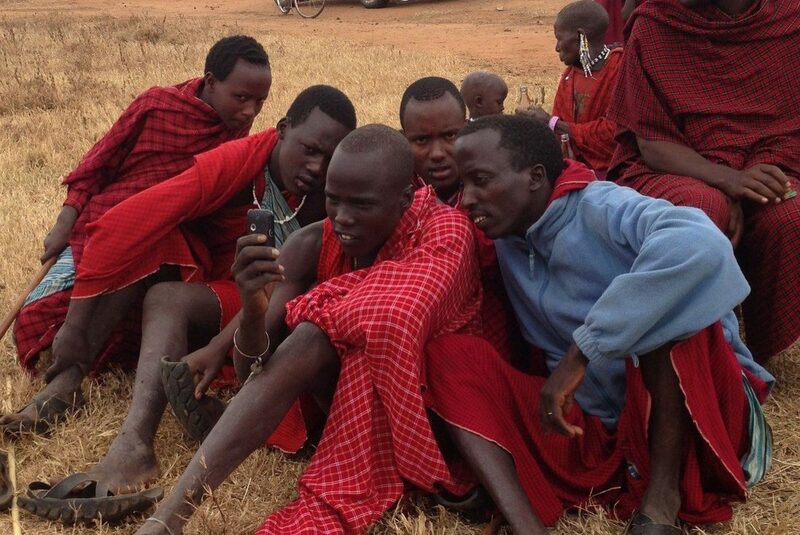 ​Study explores mobile phone use in Tanzania’s Maasai communities. More about the work lead by Dr. Tim Baird at Virginia Tech University here. Also featured in The Conservation here. New grant to examine human mobility, conflict, and health in East Africa through partnership with the University of Minnesota School of Nursing and Veterinary Population Health. This project is funded through UM's Grand Challenges program, and lead by Dr. Cheryl Robertson. Welcome Michael Drake to CU Boulder! Michael Drake is a Ph.D. student at CU Boulder where he is advised by Joel Hartter and Dan Doak. He received his MS from North Carolina State University and a BA from the University of Pennsylvania. Michael hopes to combine his background in terrestrial ecology and human dimensions research to explore how human populations drive conservation in the modern age. National Geographic Society's Committee on Research and Exploration and the University of Minnesota's Consortium on Law and Values in Health, Environment & the Life Science funds new research in the Rwenzori Mountains of Uganda. The Rwenzori Mountains separate Uganda and the Democratic Republic of Congo and rise to 5109m. They contain 1 of 3 sets of glaciers on the African Continent and are a UNESCO World Heritage site. The collaboration between the University of Colorado, the University of New Hampshire, and the University of Minnesota focus work in this fragile environment of immense biodiversity value and rapidly increasing human population Our goal to understand decisions regarding soil fertility and conservation strategies, and what these behaviors mean for household well-being and environmental health. 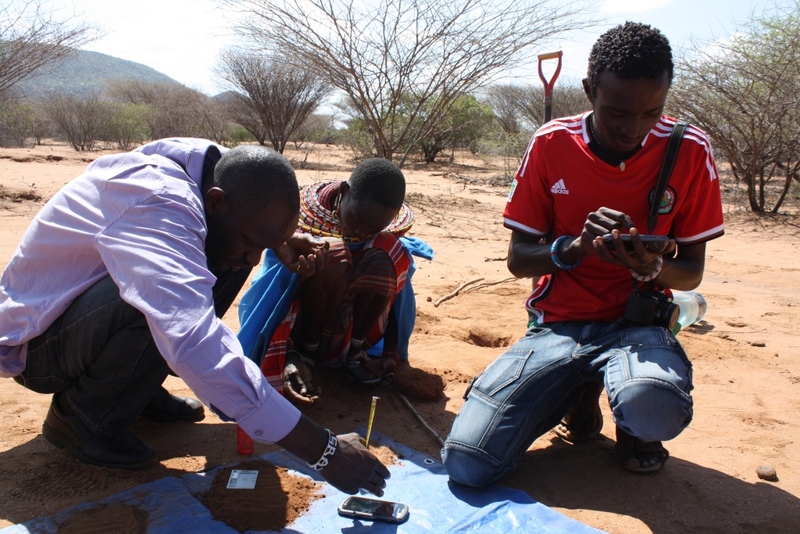 ​The University of Colorado Innovative Seed Grant supports new research on mobile phone use and drought management in southern Tanzania. Mobile phones are transforming economies of developing countries and will be the primary mode of internet (and information) access for hundreds of millions of people for the foreseeable future. Mobile technologies can play a key role in this transformation by facilitating widespread and low-cost agricultural knowledge and information, increasing human capacity, and by providing more effective (and efficient) development interventions. In principle, the use of mobile technologies can provide a simple and accessible interface for information sharing and decision support. This projects will identify the barriers and opportunities for mobile phones to supply trusted and useful agricultural information to agro-pastoral communities in semi-arid East Africa? ​More here. CAFOR director Joel Hartter participates at the ​Oregon Forest Collaboratives Network Workshop in Redmond, OR. Joel Hartter will once again be part of the National Geographic in the Rockies program. A group of high school students from around the country will gather in Boulder in summer 2016 to learn about conservation, climate change, and communicating science. You can find more about the program here. Joel will serve as one of the experts for the program. 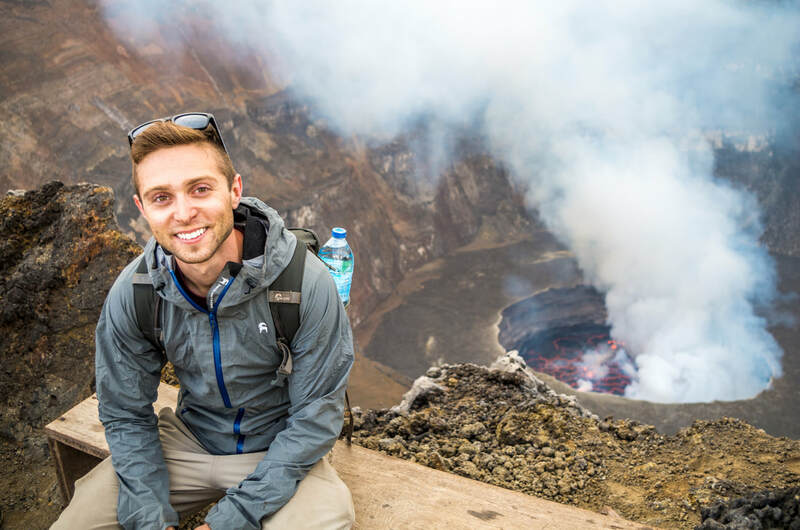 PECAR graduate student and National Geographic Young Explorer Nick Dowhaniuk is featured on National Geographic's website here. 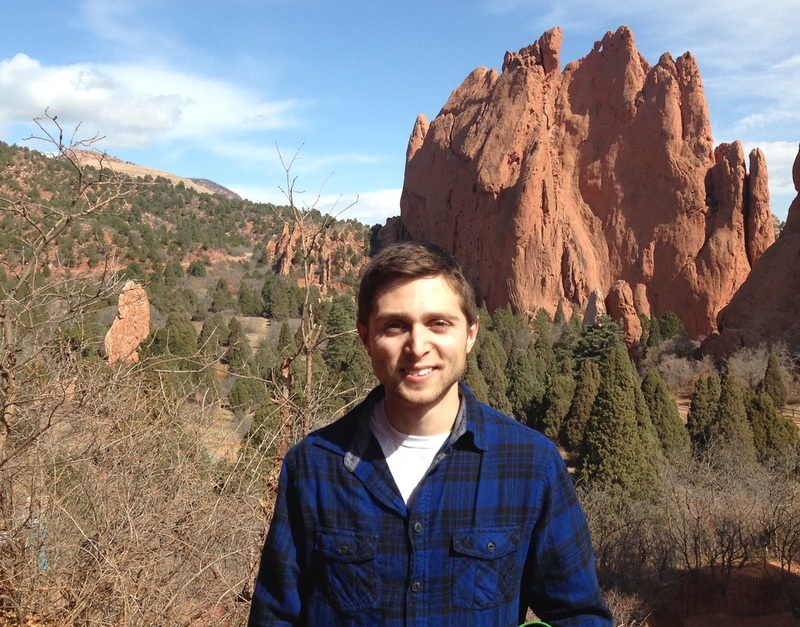 Welcome to Jon Salerno who joins the PECAR team as a Research Associate. Jon is a quantitative social scientist, trained as a human behavioral ecologist in the PhD program in ecology at the University of California, Davis. 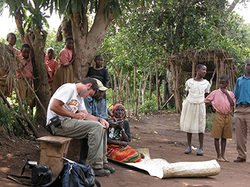 Salerno has spent 5 field seasons in western and southern Tanzania. 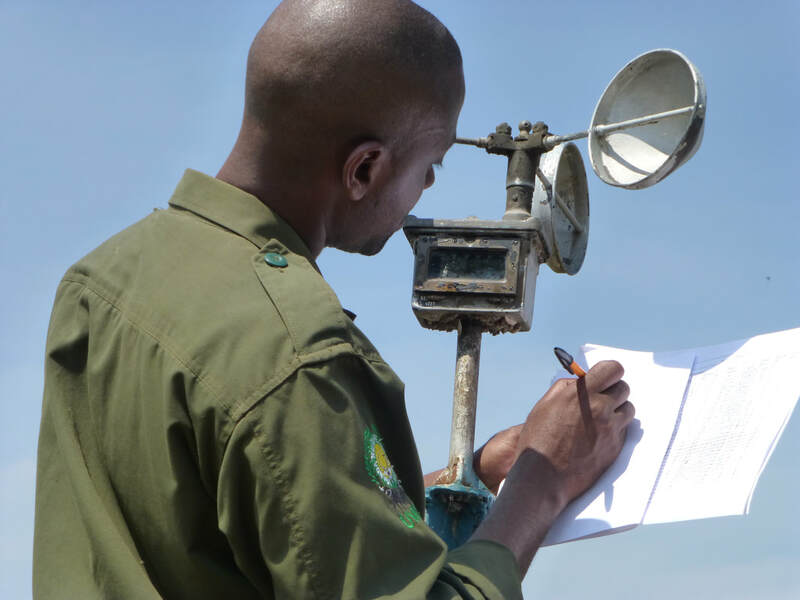 During these periods he conducts research in households and communities bordering Katavi National Park and in the Southern Highlands near Kalambo Falls. National Geographic in the Rockies. PECAR co-Director Joel Hartter will be part of the National Geographic Expeditions, on campus at CU Boulder in June. High school students from around the country will come to learn about Colorado, climate change, and the outdoors. Explore climate change, wildlife conservation, and adventure storytelling through seminars and hands-on activities. Get experience with the technology and science used by Nat Geo explorers. Develop a campaign or multimedia project. See Q&A with Joel here. How do forest landowners feel about local land management practices? 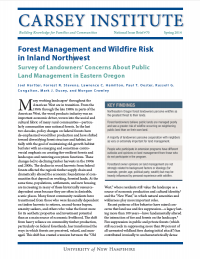 This brief reports the results of a mail survey of forest landowners in northeastern Oregon conducted in the fall of 2012 by the Communities and Forests in Oregon (CAFOR) Project at the University of Colorado and the University of New Hampshire in cooperation with Oregon State University College of Forestry Extension. The mail survey was administered to understand who constituted forest landowners in these three coun­ties and their perceptions about forest management on both public and private land, as well as risks to forests in the area and the actions they have taken to reduce those risks. Joel Hartter, Sadie Ryan (SUNY ESF) and collaborators comment on data stewardship and spatially explicit data in PLOS Biology. September 3, 2013. Joel Hartter featured in the UNH Magazine's Winter 2013 edition. In the Bush: The Misadventures of a Geographer. The College Letter. Newsletter of the College of Liberal Arts, University of New Hampshire. September 10, 2012. Invent new ways to succeed. LaGrande Observer. July 16, 2012. Three Geography Students Win Research Awards. College of Liberal Arts Blog. June 2012. CHANS-Net researchers find African farmers need better climate change date to improve practices. CHANS-Net International Network of Research on Coupled Human and Natural Systems. March 15, 2012. Change Globally, React Locally: UNH Researchers Find African Farmers Need Better Climate Change Data to Improve Farming Practices. Press Release. UNH Media Relations. March 14, 2012. CIE Travel Grant Helps Professor Travel to Uganda. Campus Journal. UNH. November 30, 2011. UNH Receives National Science Foundation Grant to Study Changes in Climate, Population, and Land Use in Africa. Campus Journal. UNH. September 28, 2011. New Understanding of How Humans and the Environment Interact. Press Release. 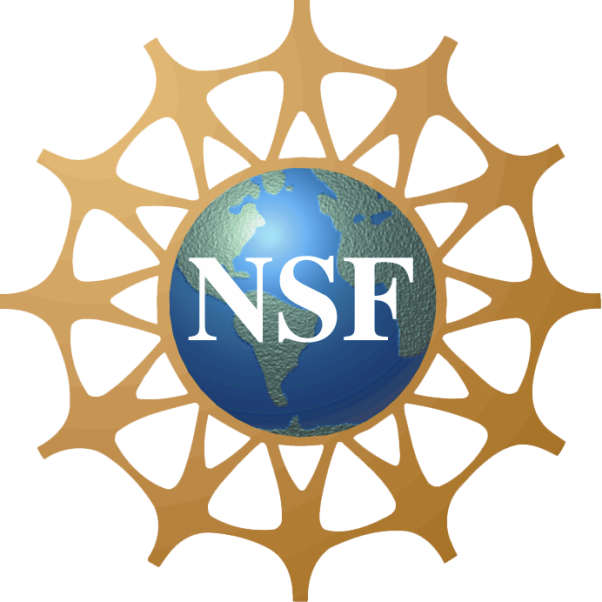 National Science Foundation. September 21, 2011. GSU Scientist Examines Climate's Role in Pressures on Protected Lands in Africa. Press Release. Georgia State University. University Relations. September 16, 2011. Faculty Travel Report: Research on parks in Uganda. Center for International Education. Fall 2011. Center for International Education Newsletter. Report of sponsored research. Fall 2011. UNH Research Leveraging Initiative Awards Made to Eight Interdisciplinary Teams. Campus Jounral. UNH. September 14, 2011. Carsey Institute Researchers to Survey Oregon Residents on Views about Community and Forest. Press Release, UNH Media Relations. September 2, 2011. UNH Received $400K Grant to Study How Changes in Ecosystems Impact Livelihoods in Resource-Dependent Areas. Press Release, UNH Media Relations. October 14, 2010. Jayson Jacoby. Study aims to take pulse of Northeastern Oregon's land, people. Baker City Herald. June 23, 2011. Front-page story about USDA-funded research in eastern Oregon. Brian Addison. University studies forest, people. Wallowa County Chieftain. June 23, 2011. Front-page story about USDA-funded research in eastern Oregon. NIFA in the News. Week of June 20, 2011. Reporting of USDA National Institute of Food and Agriculture. Bill Rautenstrauch. Study takes in-depth look at forestlands and resource-dependent communities. The Observer. June 15, 2011. 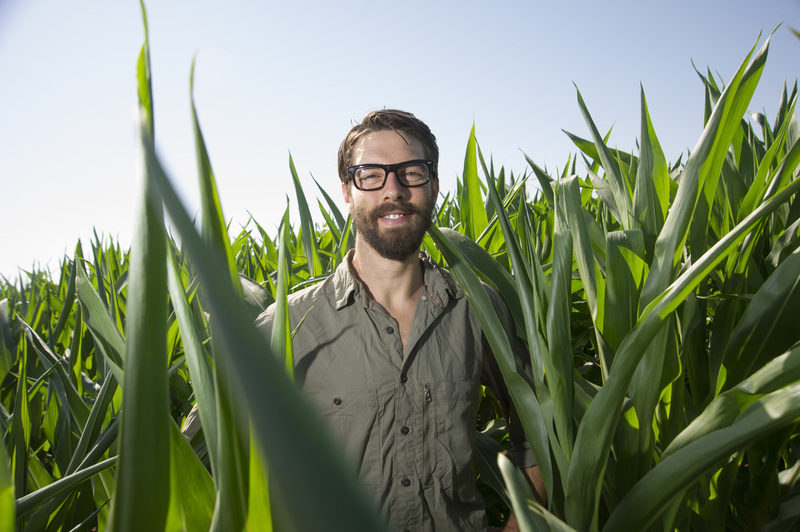 Feature story about USDA-funded research in eastern Oregon. Engaged Scholars Academy 2010. Campus Journal. UNH. February 10, 2010. Center for International Education Newsletter. NH International Seminar features UNH scholars speaking on a variety of research topics. Spring 2009. David Brooks. 2009. Love Thy Neighbor. How Ugandan farmers cope with a wildlife park. University of New Hampshire Magazine, Spring, 12. Center for International Education Newsletter. Report on research on parks in Uganda. Fall 2008. Faculty Travel Report: Research on parks in Uganda. Center for International Education. UNH. Fall 2008.